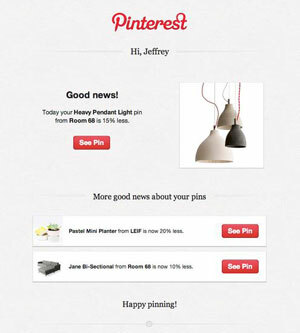 Pinterest announced a new feature last week, an email notification sent to users when a product they have pinned drops in price. This “price drop notification” is an enhancement to the product price pins rolled out in May, which associate prices with the products pinned on the site. Product pins with prices have proved very popular since their launch, receiving 36 percent more likes than those without. The new price drop notification feature will roll out with very few customization options – users will either opt-in or opt-out in their settings menu. At only three years old, Pinterest is currently the fourth-most popular social network and boasts over 70 million users (97% of which are female and more than 50% of which are in the USA). More importantly, it has managed to become what Google, Facebook, Twitter and others have long pursued: an effective merger of social and commerce. A study of online shoppers in the USA found that Pinterest is the second largest driver of online shoppers to retail sites (11.3%), behind social media giant Facebook (85.8%) and ahead of Twitter (2.9%). Additionally, Pinterest shoppers spend up to 50% more per checkout than their Facebook and Twitter counterparts and 70% more than visitors referred from non-social channels. With no advertising product available to push reach, brands will have to rely on the organic behavior of users pinning to share things of interest with others – more than 80 percent of pins are repins – to drive engagement with their branded pins. With the heavy shopping season soon approaching, retail brands would be remiss if they did not do all they could to harness the potential – and reality – of the social commerce phenomenon that is Pinterest. Brands that focus on creating product price pins that are aesthetically rich will find themselves the most successful; the price drop notifications should spur interested pinners into action and convert them into customers.